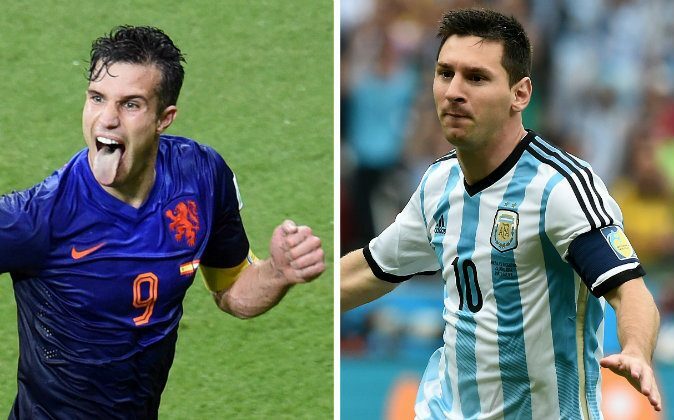 Robin van Persie, Ron Vlaar, Nigel de Jong, and Marcos Rojo start for Netherlands and Argentina. Van Persie was a doubt to start today’s match owing to a stomach problem. The 30-year-old striker, who plays for Manchester United at the club level, trained separately on Tuesday. Vlaar injured his knee in Netherlands’ quarter final match against Costa Rica, but he returned to full training on Tuesday and will start today. De Jong injured his groin against Mexico and was given two to four weeks to recover. Given his inclusion, the 29-year-old midfielder clearly has recovered ahead of projections. Meanwhile, Marcos Rojo has been restored to Argentina’s starting eleven after missing out on the quarter final due to a suspension for having picked up two yellow cards. See an AP article below. BELO HORIZONTE, Brazil (AP) — Brazilians are having a difficult time trying to fathom how it all went wrong so quickly against Germany in the World Cup semifinals. With the humiliating 7-1 loss still very raw for Brazil supporters, players struggled to find explanations for the country’s worst ever World Cup defeat. Brazil conceded four goals in a seven-minute span and trailed 5-0 at halftime on Tuesday, and never had a chance to mount a comeback at the Mineirao Stadium. The dream of playing a home final at the Maracana was obliterated, and players knew they were going down in history for the wrong reasons at their home World Cup. Germany scored its first five goals by the 29th minute as Brazil’s defense self-destructed, shocking the crowd at the Mineirao and everyone else watching on television. Tuesday’s result equaled the margin of its previous worst defeat — a 6-0 loss to Uruguay in the South American championship in 1920. It was the worst World Cup loss ever in numbers, and probably nearly as heartbreaking as the home defeat in the 1950 tournament, the so-called Maracanazo. Although no one was making excuses, Brazil played without star striker Neymar because of an injury and captain Thiago Silva because of a suspension. Brazil now has to play the third-place match on Saturday in Brasilia against either Argentina or the Netherlands. But many of the Brazilian players won’t be back in Russia to try to rebound from the historic home defeat. Only seven players will be 30 years or younger in 2018 — Marcelo, Luiz Gustavo, Paulinho, Willian, Neymar, Oscar and Bernard. “We know this will be remembered for a long time,” veteran defender Maicon said.